Yay! The latest Twisted arrived yesterday! More duty fees, still worth it, must initiate self-restraint procedures anyway. I think the new Weimaraner colourway is going to be fabulous in the Adventure Sweater, yes? It looks completely different than I thought it would, and matches even better than I hoped. Also I love it, which is beside the point but a nice perk. 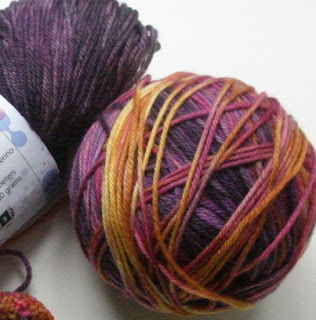 I've spent some time this morning adding my latest indiscretions into my Ravelry stash list and, well, ack. I seem to have come a long way since the days when I bought yarn, knit with it, and bought more yarn. In my defense - back then all the other knitters I knew were students knitting from patterns. We all knew exactly how much yarn we needed, and none of us had the money to go buying stuff we couldn't use that day. Now the other knitters I know are Evil Enablers. First there's Karen, whose stash size is still nearly twice the size of mine and had better stay that way. Oh, the beautiful stuff she finds... and then the projects she chooses... it makes me want to have all the same things. Then there's Kathi, ditto re. 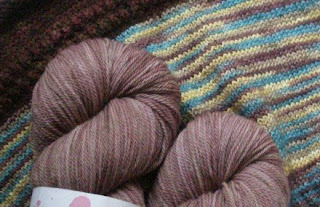 the yarns and projects, who says it's important to have a big stash when you're designing patterns so you're not held up at the point of inspiration because you don't have the right yarn. Sadly, I have found this to be true, and while I am not designing patterns to the degree of publishing multiple books of same (watch for The Big Book of Socks coming out this fall!) I do still prefer being free to knit on impulse.